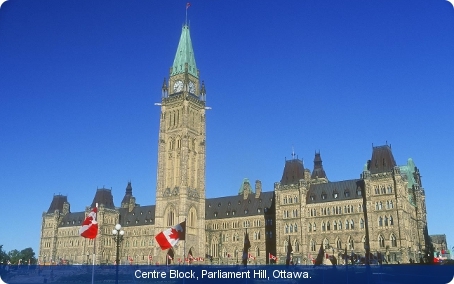 Canada is a constitutional monarchy and a parliamentary democracy with a federal system and strong democratic traditions. As a Commonwealth Realm, Queen Elizabeth II is Queen of Canada. Her duties are performed by the governor-general at the federal level and by lieutenant-generals at provincial level. The governor-general is appointed by the Queen on the advice of the prime minister. Surprisingly, the role of Canada’s prime minister is defined neither by law nor by the written constitution, but it is effectively the most powerful role in Canadian politics. The prime minister is traditionally the leader of the largest political party in the House of Commons. He or she selects cabinet ministers and allocates cabinet positions. The prime minister and cabinet have executive power at the federal level. The federal parliament is made up of the Queen, the elected House of Commons with 308 members and the appointed Senate with 105 members. Elections take place at least once every five years. Members of the Senate, whose seats are apportioned regionally, are chosen by the prime minister in consultation with the cabinet. Canada is composed of ten provinces and three territories. The provinces have a large degree of autonomy from the federal government. They are responsible for most of Canada’s social programmes such as health and welfare and have unicameral, elected legislatures. The territories are controlled and administered by the federal government, although elected territorial councils have increasing jurisdiction in local matters. Justice is administered both at a federal and provincial level, in a four-tiered structure. The Supreme Court resides over the judicial system and is the final court of appeal in civil and criminal cases, for both federal and provincial appeal courts, and also deals with constitutional issues. In the next tier are the appeals courts. The third tier consists of the Federal Court, the Tax Court of Canada, and the provincial and territorial superior courts of general jurisdiction. The fourth tier is of provincial courts, including the Traffic Division, the Small Claims Division, the Family Division and the Criminal Division. Judges in the federal courts and the superior provincial courts are appointed by the federal government. The Constitution Act of 1982 includes the Charter of Rights and Freedoms. Canada first came into contact with the European colonial powers five centuries ago, when the profusion of fish off Newfoundland attracted French, Spanish, Portuguese and English fishermen. Many British and French colonies were established in Canada during the seventeenth and eighteenth centuries. British efforts to bring together various British colonies in Canada gathered pace in the nineteenth century. Since the Statute of Westminster of 1931, Canada’s independence has been enshrined in law. However, Canada continued to be closely associated with Britain through kinship, trade and other networks. Furthermore, Canada is a founder member of the Commonwealth. Between 1968 and 1984, Canadian politics was dominated by the leader of the Liberal Party, Pierre Trudeau, who became prime minister four times. During his administrations, social welfare was increased, immigration was liberalised and multiculturalism was promoted. Soon after Trudeau’s retirement in 1984 the Liberal party was ousted by the Progressive Conservative Party (PCP) under the leadership of Brian Mulroney. Kim Campbell took over from Mulroney in 1993, becoming Canada’s first female prime minister. The Conservative party under her leadership was then heavily defeated in the 1993 elections and the Liberal Party returned to office. The 1997 elections, which left the Liberal Party in power but with a reduced majority, exposed the increasing regionalisation of Canadian politics; nearly two thirds of the Liberal Party’s seats were won in Ontario. The 2006 elections resulted in a hung parliament. The incumbent Liberal government was replaced by a minority Conservative government with Stephen Harper as prime minister. In 2011 the Conservatives won a parliamentary majority. The new legislature included 76 women, more than ever before.